Tu sei in spiaggia! Swim, snorkeling, surf o semplicemente rilassarsi in spiaggia o piscina! Immergersi nella bellezza naturale di Kauai! Il tutto a pochi passi! Il tuo secondo piano, con vista sull'oceano Lanai è a soli 300 metri dal mare nella soleggiata zona di South Shore di Kauai Poipu, 'l'Isola Giardino.' Sarete cullati a dormire dalle onde dell'oceano e gli alisei sussurrano attraverso le palme in adiacente Prince Kuhio Park. La vista dalla camera da letto è di 180 gradi, oceano di montagna. L'atmosfera qui è 'Classic hawaiano,' morbido e rilassato. Due spiagge sono raggiungibili in tre minuti a piedi e funzione protetta nuotare e fare snorkeling con le tartarughe e pesci all'interno della barriera corallina, così come il surf a PK di, Centri, e Acid Drops sulla barriera corallina esterna. Molte altre spiagge e surf spot si trovano nelle vicinanze. Nelle vicinanze si trovano tutti i ristoranti e Poipu Koloa, campi da golf, negozi e servizi. Altre attrazioni South Shore di Kauai sono facilmente raggiungibili in auto. Da non perdere il Beach House Restaurant, dall'altra parte della strada, famosa per la magnifica vista del tramonto. Valore! Questo è uno dei segreti meglio custoditi per i valori in affitto a zona Poipu. La nostra unità condominio ben arredate, una camera da letto è stato recentemente completamente ristrutturato con mobili nuovi. È dotato di un re letto in camera da letto vista mare, cucina, sala da pranzo, bagno, lavatrice / asciugatrice, e un giardino con vista sul soggiorno. Animali non sono ammessi, No Smoking. I giardini sono rigogliosi e ben curati dispongono di una piscina, area barbecue e parcheggio coperto. Prince Kuhio è un piccolo complesso ed è classificato come un 'valore in oro massiccio' da 'The Ultimate Kauai Guidebook'. This unit was wonderful! Very well stocked and very clean. Great experience! Patti & Doug’s vacation rental was a great place to stay on the south shore. Very close to many amenities and beaches. The unit was clean and well stocked for all our needs. We would definitely stay here again. Mahalo, Patti & Doug! This was our first trip to Hawaii, as well as our first time using VRBO. Everything went very smoothly, no issues. The condo we rented was very nice, very clean and well kept. The unit was well supplied, we did not have to buy anything other than food. The beach chairs, umbrella and cooler are a very nice touch. We were only a short walk away to excellent snorkeling, nice to not have to worry about personal items as we could leave them all in the room. Kuhio Park right off the patio is very nice, makes you feel like you are on a large estate. There is very little traffic and what is there is restricted to 15 mph. You won't need an alarm clock, the roosters and parakeets will for sure have you awake in time to enjoy a coffee and watch the sun come up. The Beach House restaurant is right cross the street, a very elegant dining experience, great food, a bit on the high end price wise at about $150.00 for a meal for two, but very nice and the food is well worth the price. A rental car is a must when visiting Kauai, so be prepared, the extra insurance will run you about $40.00 per day but what do you do? Be sure to drive around and explore the island, the Popei Beach beaches are nice but quite busy, a half hour drive west to Waimea where you can experience large flat beaches with great sand and very few people is well worth the effort. We took a helicopter tour of the island, very nice and certainly the only way to truly see the beauty of the island. We hiked the Waimea Canyon, a very pleasant intermediate walk, the scenery is well worth the effort. The Kauai Coffee Estate is very interesting and a great place to try and to buy some of the best coffee. Be sure to scout around in the small towns as there are some great little Mom and Pop type restaurants. If you are looking for a vacation spot with lots on night life and clubs this may not be the island for you, I am sure there are some spots but you will likely have to drive. All in all a great vacation, we would definitely come back. The only reason I rated it 4 star is the we found the couch to be very uncomfortable (certainly not your recliner at home) and the carpeting a bit out of place, ceramic tile would be much more suitable in this very humid climate, also wouldn't have to worry about tracking in some sand. Great location and overall great stay! 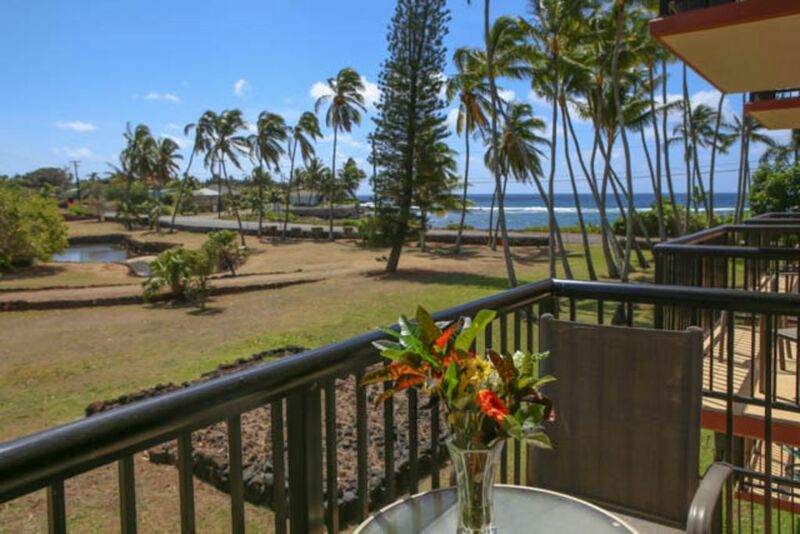 Property is located on the lovely Prince Kuhio grounds. Wonderful ocean view from balcony and bedroom with garden view in living room. Pool lounging was quiet and nearby. Close to beach, snorkeling, shaved ice, wonderful Beach House restaurant and shopping center. Bed was ok but could use some upgrading. Not as comfortable as I would've liked. Sheets kept coming off in the middle of the night too...for no known reason. Would I stay here again? Yes! We now have all new sheets. Thanks for letting us know! We had a great time. Unit was very well stocked as others have stated. Really appreciated the smorkel gear. Also agree with a previous reviewer that the boggie board is tired. No AC needed. Excellent breeze in the bedroom. Less so in the livingroom. Host were very responsive to all questions. Thanks Mary......we are so glad to hear that you had a good time. I guess the boogie board has to go!! P.S. Thanks for the tip on PK reserved parking spaces behind Lawai Beach Resort. The covered parking kept our car cooler and straight in spaces made entry and exit much easier than angled spaces in uncovered front parking area.